Spring is on its way here in lower Michigan. The snow is all gone (I hope, you never know in Michigan) and the temperatures have been pleasant. All good signs that spring is coming. I love spring, I can open up my windows in the house, I hate that closed in feeling I have a winter long with the windows closed. Sometimes I open them up in the winder, just to get some fresh air in the house. I love the smells of spring, the fresh cut grass, flowers and the new leaves. All have a distenct spring smell. The other day I was looking around my house at the walls and was thinking, I need to freshen up the color, time to repaint, this too is another sign of spring, when we decide to start our spring cleaning. And of course Easter is on it’s way, and that means spring is also. We anticipate spring for weeks and months before it’s arrival. We look for any sign that spring is just around the corner, a sunny day or the temperature in the upper 40’s or low 50’s or even a baseball report on the news. Any little thing will get us craving spring even more. I know for me come January I am done with winter and spring can come anytime after January. But as we know spring has it’s own timing and we are powerless to do anything about it. All we can do is wait, sure we can prepare for it, start to get our spring/summer outfits out, start to plan the weekend yard work and activities, but in truth we are powerless. Spring will come with our with out or preparations. 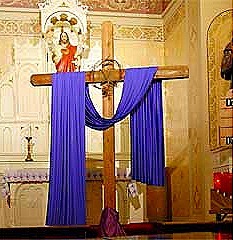 Lent is much like that, lent will come with or with out us, Easter will happen even if we don’t prepare for it. Much like spring Lent has it’s unique qualities, the color purple is used in Church, Ashes on our foreheads and palms given out and at Easter Mass the sights and smells of Easter Sunday are strong, the flowers and incents mix and mingle to create a sweet pungent smell that I look forward to each and every year. All are signs that Jesus is resurrected from the dead, that our sins have been forgiven and eternal life has been granted. All this will happen with or with out our own preparation, just like spring will come with or with out us, so to will the Glory of God. 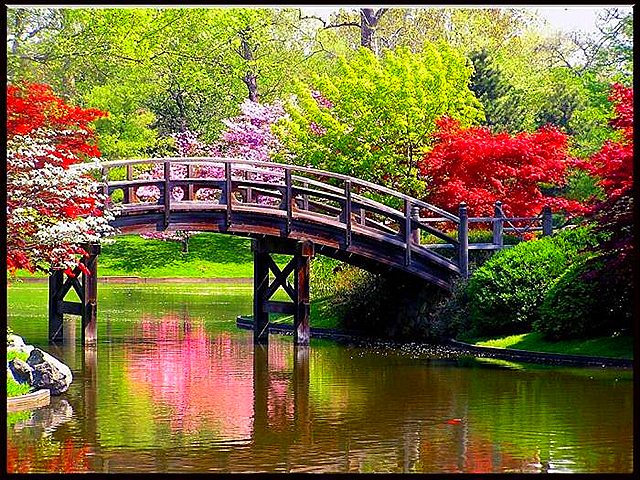 But unlike spring, God invites us along for the journey, to share in the triumph of His Glory. Yet all to often we choose not to journey with Him, we choose to journey alone, hidden from God in our own self indulgence and ignorance of His saving grace. Easter will happen as it has happen for over two thousands years, this year why not try and journey with Jesus this time. Walk the paths in the garden and smell the smells and hear the sounds. Feel the warm breeze and hear the leaves as they talk to each other saying “Hosanna in the highest” as our Lord wanders past them. Feel the agony of our Lord as he prays to His Father for courage and humility, not for himself but for us, that we may be humble and show courage in the face of persecution for His sake. This Lent and Easter Stand with our Lord as he stands accused yet silent, offering no defense for is convictions and faith. As He shows us how to stand trial on His behalf. Walk beside our Lord as he stumbles along to His crucifixion carrying the burden of the cross, not his cross but ours that he freely took from us to lighten our yokes. Let us learn from Him how to carry the crosses of our neighbors as we to stumble along the path. 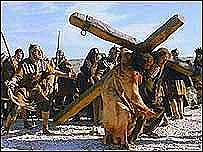 Like Simon of Cyrene, let us to pick up the cross a cross that is not ours, and carry it the end. Like our Blessed Lord, let us too freely offer our lives to the Heavenly Father in sacrifice. Offering out humanity in our humility and reverence to the father who loves us. Let us suffer for the Glory of God upon our cross and like or Lord, let us forgive our persecutors and offer them instead our love. This Lent and Easter let us feel the nails as they are nailed in to the Blessed hands our our savior. Let us hear the wailing and sobbing of our Blessed Mother as she weeps for her only Son. This Easter let the Resurrection of our Lord not only move the stone covering His tomb but also the stone covering our souls. This Easter let us remove our death garments and replace them with the garment of everlasting life. The Easter let us truly experience the Passion, Death and Resurrection of our Blessed Lord. Let us journey along side Him. This entry was posted in church, death, easter, faith, forgiveness, Lent, Life, Love, Mass, prayer, Salvation and tagged activities, agony, arrival, Ashes, BibleGateway, breeze, christ, church, Colossians, colossians 3:12, compassion, convictions, courage, Cyrene, death, defense, Dolorous, easter, faith, father, Feel, flowers, garden, garment, garments, glory, grass, Hosanna, ignorance, indulgence, January, Jesus, Life, lord, Mass, Michigan, Mother, news, ours, outfits, Passion, path, paths, patience, Paul, persecution, preparation, preparations, qualities, resurrection, reverence, rights, Savior, self, signs, simon, Sometimes, souls, Stand, temperature, temperatures, tomb, truth, walk, walls, winter, yard. Bookmark the permalink.